Well, almost last of the formica! 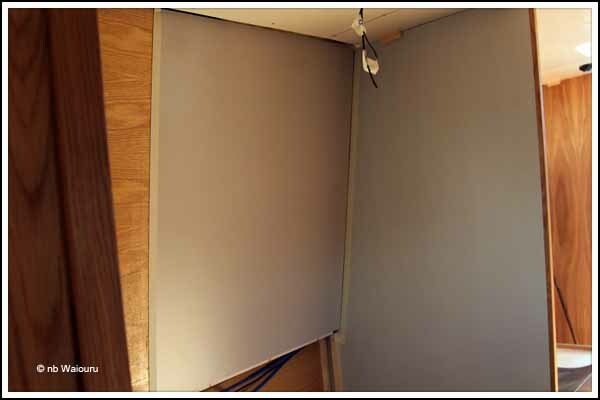 James applied the formica to the lower panels for the shower and toilet whilst Richard and I did the upper panels. Our first task was to give ourselves some additional manoeuvring space. This was achieved by removing the partition between the toilet and the shower. I seized the opportunity to take some photos. Removing the shower tray revealed the hole and slot we had previously cut in the floor for the shower waste trap and pipe. Fitting the formica to the two upper panels was quite difficult. The piece of formica needs to be exactly the right side as there won’t be any trim to conceal the corner joins. Because we were using contact glue there was no “wriggle-room”. The formica needed to go on exactly in place on the first attempt. Rather nervously we fitted the shower formica first. We started by fitting the lower edge with Richard aligning it and gradually pressing it into place as he worked upwards and outwards. I stood behind him holding the rest of the formica away from the wall and checking the corner join was square. The successful fitting of the shower panel meant the second panel in the toilet was somewhat easier. The red arrow points at the concealed porthole. I drilled a 10mm hole in the formica and Richard then cut out the porthole in the formica using his router. The vertical strip of exposed timber will be concealed by the partition between the shower and toilet. We don’t want a '”lip” under the gunwale in the shower. To avoid this a second panel is being fitted in the shower below the gunwale. 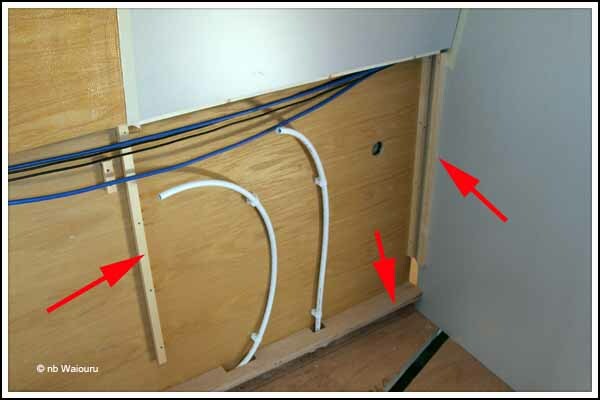 This will create a void between the existing and new panels which will conceal the hot and cold pipes to the shower mixing valve. 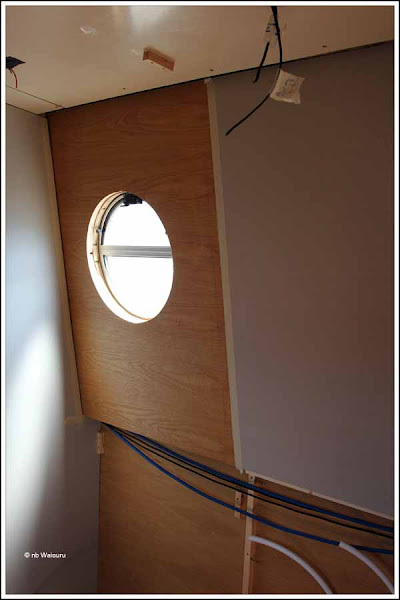 Richard has fixed battens to the walls and the bottom edge of the gunwale lining. 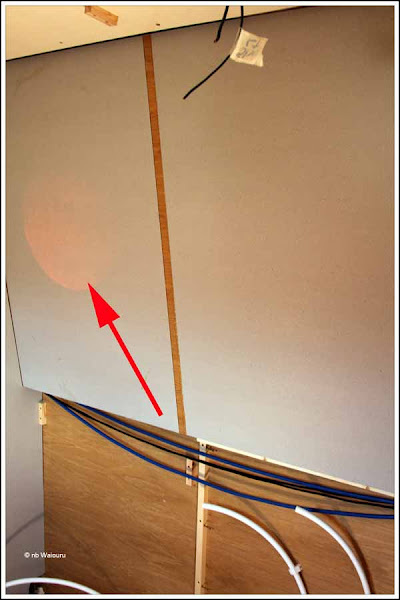 A fourth batten has been screwed in a horizontal position above the line of the shower tray. Red arrows point to the battens. 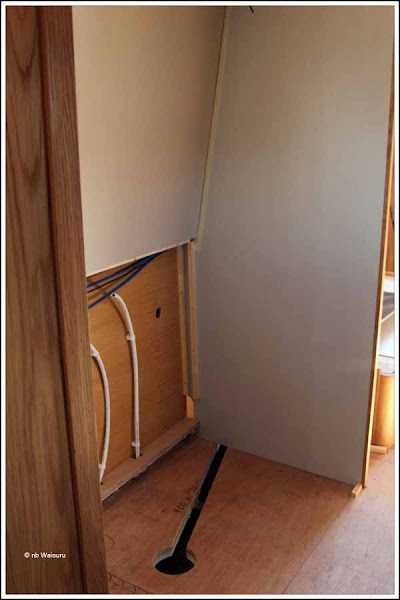 The two panels James had cut and covered with formica were then fitted below the gunwale in the shower and toilet. Only one small piece of formica is now outstanding. It’s the section on the front of the “box” that will be fitted on the lower wall behind the toilet to conceal the pipes. Tomorrow we make a start on the TV cabinet.